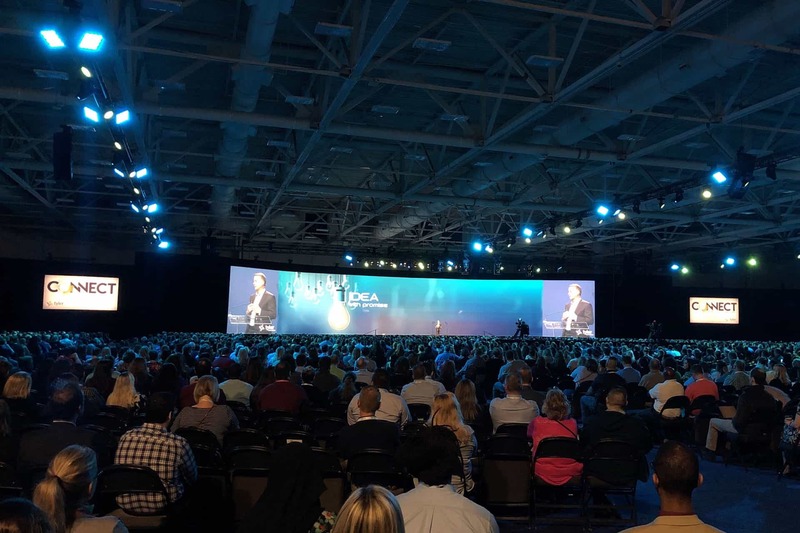 The opening session of Tyler Connect 2019 on Monday, April 8, 2019 at the Kay Bailey Hutchison Convention Center in Dallas. Two Georgia school districts were honored for excellence in school bus routing and management during the opening day of Tyler Technologies’ national user conference in Dallas. Both school districts received the 2019 Tyler Public Sector Excellence Award on Monday. Tyler lauded Marietta City Schools, which is located northwest of Atlanta, for its success with the web-based Traversa software suite to reimagine transportation operations and increase efficiencies. Griffin-Spalding County Schools, located about 60 miles to the south, was recognized for completely turning around its transportation operation with Versatrans Solutions. Marietta City Schools implemented Traversa in 2018 to replace routing that was stored in Excel, because any updates that needed to be made to the spreadsheet to improve communications, required that every stakeholder in the district be emailed. Oftentimes, confusion resulted. The real impetus for the change occurred when a special needs student was released from the bus without adult supervision. The driver didn’t have the right information to stop the student from exiting. The media got wind of the incident, which placed the district in a surprise public relations battle. However, with Traversa, Marietta City Schools staff can now access routing and student information anywhere they have an internet connection. The Traversa Ride 360 app shares real-time school bus stop and bus tracking information with parents, via push notifications to their mobile devices. Assistant Director of Transportation Lance Johnson said the results of implementing Traversa are more accurate routes that reflect real-world traffic delays, increased staff efficiency, improved parent communication, and better driver morale. Griffin-Spalding County School System began working with Versatrans several years ago, because the school district was struggling with stranded students, inaccurate routing information and failed state school bus inspections. The school district hired Todd Harris as the new director of transportation, and Greg Agen as the logistics manager, to help implement changes. Griffin-Spalding had already implemented Versatrans, but it was felt that it wasn’t using the software to its fullest potential. Significantly, Harris and Agen were already familiar with Versatrans, because of their previous work. They and their staff soon established a daily transfer of information between Versatrans and the district’s student information database, in order to ensure accuracy, and then it created a more efficient bus rider registration process. Next, they implemented the complete Versatrans suite, which included the e-Link information portal, so they could improve communications. With that, Tyler Telematic GPS and Onscreen would provide real-time route and driving data, and Fleetvision would improve maintenance and inspection processes, while Triptracker would streamline activity trips. The entire implementation procedure required 24 months. Taking full advantage of Versatrans resulted in a 22 percent increase in collected revenues from field trips, a turn-around time of less than 24 hours for bus assignments, proper accommodation of special needs students, a 92 percent decrease in engine idling time, and annual savings of $400,000, by reducing daily operations by 11 planned routes. Tyler Connect 2019 attracted a record number of 130 school transportation attendees, a company spokeswoman reported. In all, 5,800 users across Tyler’s entire product portfolio attended the Kay Bailey Hutchison Convention Center and Omni Dallas Hotel. President George W. Bush even highlighted the event on Tuesday, and the user conference concluded on Wednesday.